With this guide, you’ll find the absolutely best curling wand available today. It’s your turn to say the last word now, enjoy the curling wand reviews! Don’t we always complain about our looks, especially our hair? Even if it looks pretty good, we always find something to complain about. ‘My hair is too straight’ or ‘My hair is too frizzy’ or ‘My curls are not tidy enough’ or ‘I want beachy waves’. And there, we reach up to our heroes, Top rated curling wands in the market! Let us know your precious thoughts on the BeautiLab Editors’ TOP 10 hair wand list in the comment box below, whether you think we’ve missed something or got the order wrong. Barrel Size : 1" to 1/2"
Barrel Size : 1.25", 0.5", 0.75", 1"
19 Here are a few tips to help maintain the curls. 22 You’ve Finally Found the Best Hair Wand! We don’t have to give out tons of money to salons to give us fabulous curls because now WE CAN. We have our little curling wands to make us have tiny little bouncy curls or to give us big fancy beachy waves but always make us feel confident, make us love our hair. Wouldn’t you love to have your hair waved by a celebrity? Here is SARAHPOTEMPA Beachwaver Pro. It was Featured on the Today Show 3 times (Kathie Lee and Hoda’s Favorite Things! ), Star Magazine, Teen Vogue, US Weekly, Shape, and Allure. This rotating celebrity curling wand will save you a lot of time and with its customized extra long barrel, digital temperature control, and Left/Right control buttons, it will give you fabulous looking hair like you just left the red carpet and add volume to fine hair. 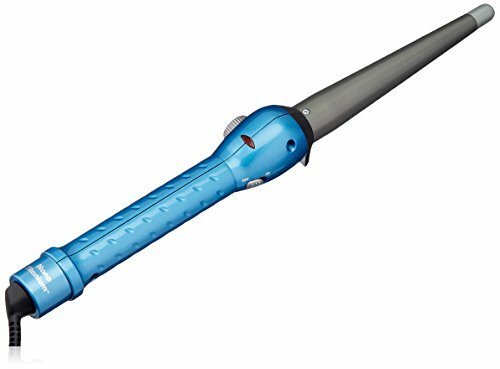 Self-rotating Beachwaver curling wand, by celebrity hairstylist Sarah Potempa, does all the work to achieve glamorous waves. 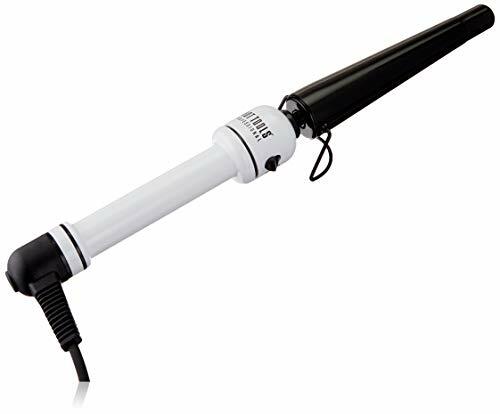 And the gentle self-rotating barrel makes it one of the best curling tools for fine hair styling. To give you pretty beachy waves, the curling wand gets REALLY hot but remember, you cannot have them with a little heat. So be careful because it’s a rotating wand and pulls your hair to wrap it, the barrel may come right near your face before you even know. The price is a little on top of the market, but I can say that if you want the best beach waves in just a little time don’t even think about it. 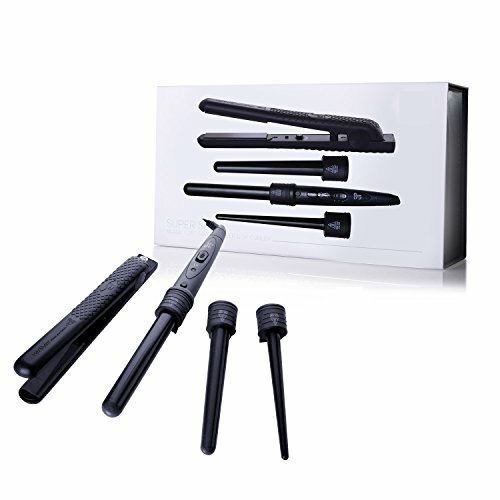 The NuMe Signature Titan 3 curling wands use negative ion technology. It provides you the long lasting, shining, smooth and healthy curls, which you have been wanting, without any damage. It’s a titanium set which comes in three different barrel sizes (19mm/ 25mm/ 32mm), and utilizes the latest titanium and digital technology. Nume Curling Wand Set is a little overpriced, but I think it’s because it is equipped with some latest Technologies. If you are interested in the higher temperatures and advanced technology here’s something for all you beauty technophiles. You can have different types of curls with its three different sizes of barrels. You can have big beachy waves, or you can have tiny little bouncy curls. There may be a problem which happens nearly with every different sized barrel wands, the clips may get loose in time, but looking at those trend hair Technologies, it’s worth a shot, if you are ready to give out some big money. What else can a woman want from a set of styler? It has three sizes of curling barrels and a straightener. So this little set can be your new best friend. Innovative MCH ceramic heater heats up in a second, Onyx ceramic plates to maintain high levels of heat, Negative Ion Technology eliminates static and frizz by neutralizing positive ions, it heats up to 500F degrees so you can use it for thick and curly hair too, don’t worry it comes with a thermal protective glove so you can’t burn yourself. And with its superheat, you get the same results twice faster. This curling wand set provides you four different tools for just one tool’s price, actually the affordable ones. The only problem is that changeable barrels may get loose and stop heating up, like in any other 3 in 1 curling wands. But it’s worth taking the risk. Do you have naturally curly and frizzy hair and want it to calm down? Do you want to have both big waves and little curls? 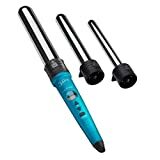 BaByliss®PRO Nano Titanium ConiCurl curling wand can work for you. With its nano titanium barrel, it avoids frizzing and gives your hair a smooth look. And it is a conic curling wand so you can use its thin top to have little bouncy curls and use its thick end to have big bouncy waves. Its price is nearly funny for such a useful and healthy product. Its breaking down is a very little chance because it’s not a complex product. You can carry it around in your bag, it’s pretty light and easy to pack. For a curling wand this little, its heating is really remarkable. Instant heat up and recovery feature up to 450 degrees. And again, for such a little curling wand, it.2s pretty strong. With its high heat, the curls don’t fall down easily, you can have them even in the morning after. I think you should give this little hero a chance for a very little price. 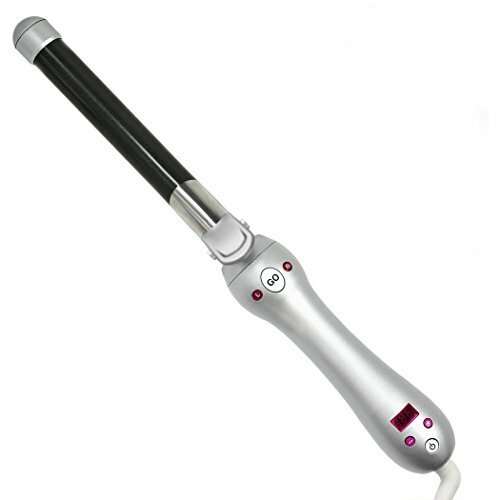 You can open your own salon with this curling wand with five different sizes and curling types. You can have big waves or bouncy little curls, or just dancing little waves anytime you want now. The curling wand has; Multiple Heat Settings, Quick Heat Up, LED Indicator Light, Ceramic Barrel, Tourmaline Coated, Swivel Cord, Interchangeable Pieces, High Heat. With these numbers of features, this curling wand becomes a perfect curler for all types of hair. Its temperature ranges from 122F to 410F. So be careful with its ceramic super-hot barrel. But it comes with a heat glove, so it’s not a serious thing to concern about. There is only one thing to concern about and it’s the clips. While changing the barrel you can feel how hard the clips are and maybe they will soften in time. Or maybe they may get really soft and may fall off. But its price is pretty affordable so I think that it’s worth trying anyway. Do you want to have long-lasting, strong curls? Then you should try this very traditional, easy to use clipless curling wand. It heats up fast and gets really hot. But with its rheostat control, you can control the heat and select the right heat for your hair. That feature also prevents you from getting burnt. Even if you want to use it on the highest heat, it comes with a thermal glove which also prevents you from getting burnt. With its ultra-smooth, frizz-free surface, and conic shape, you will have a shining, smooth and healthy curls which come in different sizes. With barrel’s thick end you can have big beachy waves, or you can have little bouncy waves with the thin top. Its price is pretty fair. But you should know that it only works great with short hair, not with long hair due to its short barrel. So if you have short hair and a little money there’s nothing you can regret after. Also, you can read further tips by clicking on the link “Best Curling Iron for Short Hair” to find simple and easy to follow steps to get your most defined spirals. Let me introduce you to your new little pink assistant. If you want your hair to look salon-quality you should hear about Remington’s Pink Ceramic Curling Wand. Ceramic is the new wanted feature when you look up the curling wands. Because ceramic improves heat distribution and selected temperature remains even throughout the entire curling wand. I call it your little assistant because it can get to 410 F heat in 30 seconds. It prevents your hair from weakening and your wand from scratching, its conic shape helps you have a natural look that holds the shape of the curl better. And helps you stay in control with a variable heat control ranging from 270-410 degrees Fahrenheit. Lets you choose the right temperature for your hair and when you find the right temperature secures it with the LCD lock to prevent the temperature from changing during use, and last but not least it has an Auto Shut-off Function which shuts itself when left for 60 minutes. But there’s a little problem there, it doesn’t have a tactile stop between the barrel and handle so you can burn your hand because you didn’t see where your hand was. Apart from all these, still a very good product for long hair I think. And here you can learn simple techniques for straight long hair to add curls. And thin hair may not be gripping the barrel enough and fall down easily but it works perfectly on thick hair. Now here’s an affordable price for a curling wand which can create wonders. With its Tourmaline Ceramic technology makes your hair frizz-free and smooth with a shiny look. It can heat up to 400F degrees in only 30 seconds. And after each curl is set, the curling wand instantly reheats to maintain a steady temperature for each curl. It also has four different heat settings so you can choose the right heat for your hair. 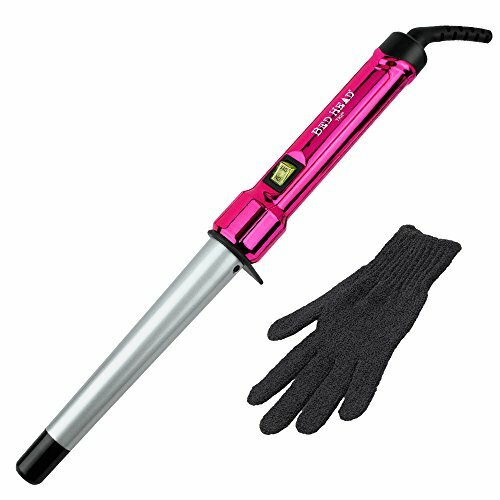 I don’t know why but it only comes with a three finger thermal glove which is useless, even if it’s a clipless curling wand. But still, you can buy another, stronger glove separately for a fair price if you want to. And if you have hair longer than chest-level length, you may have difficulties placing your hair on the curling wand. But actually, in my opinion, it’s a good product with its tourmaline ceramic technology, auto-off feature, and fast heating, for this little money. 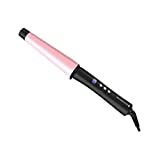 You may have difficulties getting used to this curling wand because it has little bubble bumps on its barrel on which you should wrap your hair in between to get the best results, but once you are used to it I think that you may like it a lot. Ceramic technology, as we know, helps even the heat distribution on the barrel and keeps hair’s natural oils and moisture locked inside so it also helps your curls look shiny, smooth and natural. And the thing with the bubbles is that to make your waves look whimsical and I think it provides a little bit of a retro look. Plus it may be one of the best hair curling wands thanks to its bubbles! Its heat goes up to 400 degrees F Professional high heat. You must set the right heat for your hair type and use the glove that comes with it to be sure not to burn yourself. I believe that the bubbles will be the new trend in hair styling. Are you tired of curling wands which takes all the shine and smoothness away from your hair, and giving tons of money to recover your hair? Then you should try this very affordable, frizz-free, very simple, pink little clipless curling wand; Bed Head Ceramic Tapered Wand. It’s a Tourmaline with a tapered barrel. You can use it to create loose curls on top and tight curls on the bottom. It gets super hot, so you should be careful because it’s a curling wand and you should wrap your hair and hold it yourself, and sometimes even gloves may not work fine enough. If you have long and thick hair, then it might not work well, but if you have short and thin hair, you don’t have to worry about damaging your hair! Have you been shopping for a new curling wand recently? Or looking to replace your old one? If you have, you know that there are numerous types on the market. A new shopper will be overwhelmed by the different types of wands out there. Some don’t even look like wands. Thinking about just how a bubble wand will work seems bizarre to someone who has never even seen it before. Well, worry no more because we at beautilab have all the scoop on wands.It doesn’t matter how technical it looks we will explain how each wand works and which hair type it suits. If you want to know more about the different curl patterns, each wand provides just read on. A normal curling wand is usually conical in shape .the diameter goes from large to small at the tip. A reverse wand is the exact opposite. Starting from the small at the base to large at the tip. There are two types of curling wands, both conical shaped, clipped and clipless. The first has a clip that ensures to hold your hair in place as you curl it. This type is best for short or fine hair that is harder to stay on the barrel while curling. The second one has no clip and is better for longer hair types that don’t need much hold. Curls produced are spiral in type. A large barrel curling wand means that it has a larger diameter. How does this affect the type of waves produced you may ask? It creates looser, Beachy like waves. For this barrel to work your hair must be above average length to wind on the barrel. 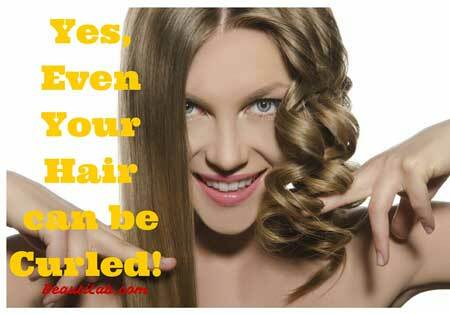 If you like tighter waves that are spiral in shape, then the best curling iron for you should have a thin barrel. Look for one with a small diameter for springy curls. These wands work exceptionally well for short or medium length hair types that can’t be found on the larger barrels.Longer hair types should look for longer wands. 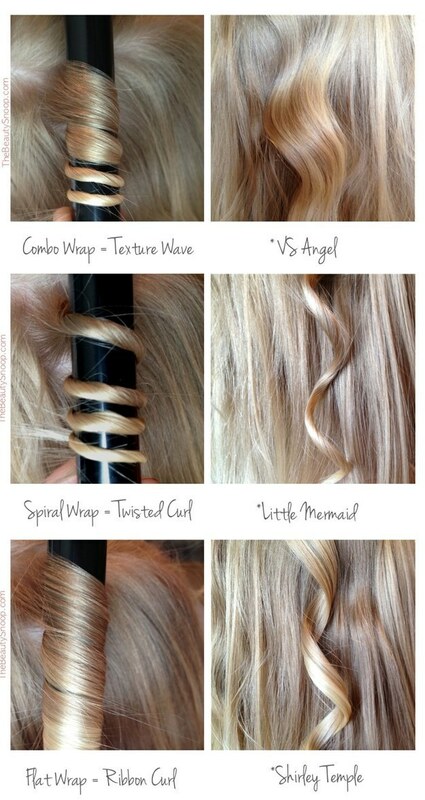 The type of wand you use depends on the curls you want to achieve. Choose large barrels for loose waves and thin barrels for tighter curls. The reverse wand creates the classic Hollywood waves while the bubble wand is known to create even, beachy waves. Looking at a model in a magazine or an actress on TV with their perfect loose curls one would wonder how they get them so perfect. Endless trials in front of the mirror and you still lack the natural look they achieve. Your curls are either too tight or too loose that they fail to give the intended effect.Creating loose curls with a wand can be achieved. Our tips will give you an idea of how you can get them looking Hollywood perfect in no time. The first step in the process would require you to section off your hair. It is so much easier to get your head curled if you do it in sections rather than all together. You can start by pinning all your hair into a bun at the top of your head. Using a tail comb or just your fingers section out a portion of hair horizontally. If you want to part your hair in the middle for a more centered look this is the time to do it. Take a small portion of the sectioned hair and separate it from the rest.Using the curling rod, wrap the hair around the wand.Do not wrap the hair too close to avoid a tight curl.The size of the curl depends on how much hair you wrap around the barrel.If you want larger curls, use more hair and small portions of hair for smaller curls.Remember that for great curls ensure that the cord is facing the ceiling as you work. If you want your curls loose but don’t want to lose all definition, let the curl cool without pulling it.For a more relaxed look tug at the curl as it cools. After curling the entire first section of hair use some hairspray to hold the curls.This step is possibly the most imperative.As you pull the next section of hair down it might get tangled up with the curls creating a big mess.The hairspray also adds texture to the hair .continue sectioning off hair, curling and applying hairspray before the next section. For most people having the curls on their face is not the look they’re going for. Once you get to the front of your head, curl your hair in the opposite direction to keep it off your face. Remember that hair products could cause breakouts especially on sensitive skin. If the curls you created are still too tight or you just want looser curls, a paddle brush would come in handy. Gently brush your curls out, and they will become more relaxed giving you a look you desire. Here are a few tips to help maintain the curls. Once you have finished creating your curls finger comb your roots to give it more body. Sleep in a satin bonnet to preserve your curls for the next day. Using texturizer spray the next day will give life back to your curls. Every time we think of tight curls, we think of all those princesses in old movies. A head of curls always seems like it needs a tiara to top it off.The style has outlived trends that have come and gone over the years.If you were wondering just how you can achieve tight wand curls we have all the tips right here. Just like every other heating tool, not all curling wands are the same.In our previous articles, we have detailed how the different wands give different results. When it comes to tight curls, you should choose either a conical shaped one or the same width barrel.A conical barrel will give more spiral shaped curls. The barrel size matters a lot when it comes to creating tight curls. Using a large barrel will give you lose curls. Always use a barrel size 1 inch or less for tighter curls. The thinner the barrel the tighter your curls will be. Temperature dial and Wand material. 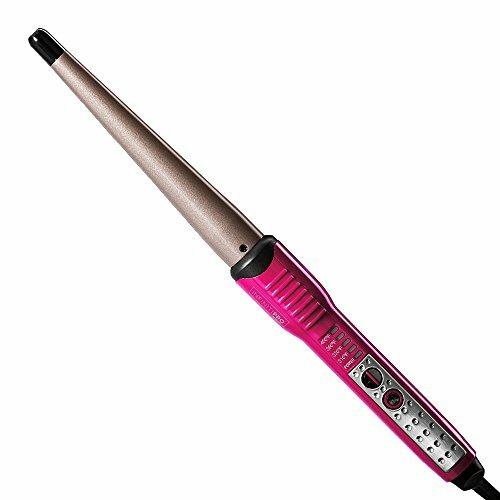 Choose a curling wand that has a temperature control. Not all curling wands have one.The fact that you will be wrapping your hair more closely means most of it will come into contact with the barrel surface and we don’t want any heat damage.When choosing which wand you want to use the material matters a lot.Using a wand that is made of ceramic is easier especially if it’s clipless. Ceramic wands cause less heat damage and are less likely to burn your fingertips. Section your hair to make it easier to curl. You can use hair ties or clips to hold it up before you start the process of curling. Take small portions of the first section and wrap it around the curling wand. Wrap the hair tightly and closely for the best curls. Spreading the hair out on the barrel will lead to looser curls.Using small sections of hair allow you to have well-defined curls. Placing too much hair on the curling wand means that most of the hair will not be affected by the heat giving saggy curls. Once the hair has been curled and released from the wand hold it in its spiral form while it cools. This will ensure it retains its form and won’t get loose while cooling. All brushes should stay away from your head if you want tight curls. Using a brush will lead to loosening the curls.If you must fluff, your roots use a tail comb or finger comb to avoid disturbing the curls. Apply hairspray to hold the curls in place for the rest of the day. Your curls can last to the next day if you sleep with a satin bonnet or pillow overnight .curling wands often heat up quicker than normal curling irons. Therefore, do not hold the curl on the barrel for too long .3-5 seconds is enough time to create the curl. Here we have a list of top rated curling wand brands and manufacturers below. We are sure that the ultimate buying guide and curling wand reviews will be helpful to select the right curling wand for your hair type. Remington– is not only a curling wand brand. They originally manufacture razors, epilators, and hair care products for both men and women. BaByliss– is a brand of Conair Corporation which sells small appliances, personal care products, and health and beauty products for both professionals and consumers. Herstyler– as the name implies, it’s a hair products brand which sells ceramic straighteners and curlers and different kinds of accessories for hair. Bed Head– a line of hair care and nail products distributed by TIGI Linea, a division of Unilever, to distributors and salons worldwide. Sedu– is a hair brand too which sells straighteners, curlers, hair dryers and other styling products. Revlon– is an American cosmetics, skin care, fragrance, and personal care company. Conair– is a corporation which we introduced above. Hot Tools– is a hair brand for both professionals and consumers which sell flat irons and hair dryers, nano-ceramic, pink-titanium and tourmaline curling wands, hair dryers and specialty irons. You’ve Finally Found the Best Hair Wand! What about the products that define your curls? Don’t use a hair wand before applying these! It’s another beautiful morning, and with determination in your mind, you tell yourself it’s going to be another great day of living and learning. You look into your mirror, and to your dismay, you notice your curly locks didn’t quite get the morning message. No worries, though! Remember, we are lucky enough to live during a time in which hair products are plentiful, and among them, you will most certainly find a remedy that will gorgeously replenish definition and life back into your locks. If you walk down the aisle of your local beauty shop, you will notice the variety of definers the modern hair market has to offer. For the most part, the products will be sorted for use during two specific times, during shower and post-shower. In the shower, of course, you will have your shampoos and conditioners, and post-shower opens up a wide door filled with creams, sprays, gels and leave-in treatments. The most important aspect of maintaining curls, however, is hydration, and the following products below incorporate some of the best technology available to achieve this. Sulfates are responsible for drying out curly hair, so a good sulfate free; hydrating shampoo would be the foundation of a proper curl-maintaining regimen. Paul Mitchell’s Spring Loaded Frizz-Fighting Shampoo is a cleanser that gently fights frizz without damaging the cuticle. Conditioners compliment shampoo like peanut butter compliments jelly, and choosing one that also does favors for your curls, will complete the during-shower treatment of defining curls. In conditioners, curls need a concoction that will soften the curls without losing their integrity, and that will seal in moisture so that the locks can last throughout the day. Briogeo Curl Charisma Rice Amino + Shea Curl Defining Conditioner does this and more. The rice amino acid deters frizz, the Shea, and almond oil hydrate, and the extract of mollis leaf and tomato fruit are guaranteed to aid in the formation of curls. So now you are out of the shower, and the next goal on your mind is curls that will hold all the long day. Curl defining creams are one of the possible solutions to achieve this goal, though it is important to find a good cream that will not leave any residue in your locks, or that will dry out the hard work that the shampoo and conditioner build up. The Curl Defining Cream from Jane Carter Solutions uses jojoba oil, Shea butter, and avocado to lengthen taut curls and at the same time hydrate. This particular product dries on quickly as you apply it, so a crunch may never form, but a bounce in your hair will certainly be added. If you are looking for a product that will continually effort for your locks then a leave-in treatment is the perfect option. These treatments work by locking in moisture for hours on end as well as protecting from any possible damage. Paul Mitchel comes through with the Full Circle Leave-In Treatment, a therapy solution that detangles and replenishes curls. It must be applied to slightly damp hair and then scrunched with the fingers for a fuller effect. Gels are notorious for leaving a crunchy texture to your ‘do, and in curls, this is not always a most desired attribute. For curls, gels need to hydrate, heal and gracefully clump in the proper style that makes the aforementioned hair type so treasured. One of the best hair gels out there for curls is Ouidad Curl Quencher Moisturizing Gel, a product that like creams sculpts definition and hold. Unlike most creams, this gel utilizes penetrative fatty acids as well as healing oils to nourish. Serums are perfect for boosting and enhancing curls on the go or throughout the day. After all the styling is completed, a serum is applied as a sort of touch-up to control frizz and add shine. The Curl Perfecting Serum by Marc Anthony binds elements of hair together to define curls and moisturize. Using Vitamin E and Hydrolyzed silk, this serum pumps up curls and will have your locks livened and brightened. Mousses and foams are excellent in that they rarely ever leave the locks feeling greasy or crunchy. They work in the same way as most gels and creams, in that they nourish and define, but perhaps most significantly, they leave the final state of the ‘do with soft and bouncy personality. Moroccanoil Curl Defining Mousse multitasks by getting rid of frizz, refining condition, and adding shine all in the same palm-squirt. It holds all day and gives locks a most favorable texture, making it incredibly irresistible to the touch. A sort of all-inclusive product, potions try to incorporate all aspects of proper curl maintenance into one multi-purpose bottle. Rockin’ Ringlets Styling Potion from Jessicurl boosts natural curls and has a hold that builds lightly fallen strands into voluminous locks. It transforms the texture of the curl into a satin-smooth strand and hydrates with aloe vera. This specific brand has a consistency that makes it simple to spread around the scalp, and to work into each section, and functions well when in conjunction with a blow dryer diffuser. Not as thick as creams, and not as delicious as fruit blends, smoothies are usually designed for a more lightweight formula to define curls without weighing down locks like gels and mousses might be known to do. Shea Moisture has developed the Coconut & Hibiscus Curl Enhancing Smoothie that restores and conditions for a lighter, shinier mane. This particular product incorporates Neem oil to control frizz, utilizes silk protein to smoothen locks, and employs coconut oil to prevent and reduce breakage. Not to mention, the hair is left with a glorious hibiscus flower scent. The products mentioned above are just one of each major category of curl defining items out there. Still, now there are more products being developed that may change the curl defining game, and provide us with the luscious locks that we love. Understand what your hair needs, and let those curls rock! If you’re trying to decide whether to buy a curling iron or a wand, here’s a detailed comparison. We tried to show you how to know and love your hair so you know how to curl your hair and have different curls using your hair wand. Don’t forget the features you should look for and remember, always look for the best curling wand size to suit your hair type. We hope curling wand reviews will help you to choose the right curler above all types of hair wands. 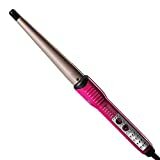 which is the best ceramic tourmaline rotating curling wand 1 – 1.5 inches or 35 mm for long hair. If you want to buy a rotating one, i would offer you to check SARAHPOTEMPA Beachwaver from the link below! You can visit https://www.thebeautilab.com/best-curling-wands-and-irons-for-long-hair/ to learn further about curling long hair.